Liz Goldie is the Tax Manager in our Cupar Office and has worked in tax for over 10 years. 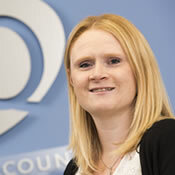 She is a member of EQ taxation and has recently competed her studies towards the Chartered Tax Adviser (CTA) qualification, now officially becoming a CTA. She specialises in personal tax, supporting clients with the preparation of their tax returns and helping them to mange their tax compliance obligations. She also regularly advises on most aspects of Income Tax and Capital Gains Tax and is currently involved in Estate/Retirement Planning and Employee/Employer tax.